Love this boat! Easy to stand and fish. Very maneuverable and stable. One major flaw: the seat! I think kayak seat comfort is one of the most crucial parts of a kayak. I'm 6' , 200lbs , 34" waist normal medium sized guy-not big-not small. I found the seat to be uncomfortably narrow with it's side bars cutting into my thighs after just a couple minutes of sitting in the kayak. I tightened all of the webbing seat straps and it made no difference. I also felt the seat sagging deep in the middle, not flat support but sagging "U" shaped support. The seat back and lumbar comfort was good. Overall the kayak has very nice well thought out features for fishing. They need to redesign the seat bottom asap and make it wider. Hobie and Native make the most comfortable/supportive seats for all day comfort and are miles ahead of all other manufacturers. Love the kayak. Stable. Seat is comfortable. Paddles relatively easy. Great dry storage area. Really stable I am a small guy so using this kayak is like being on small boat. I do wish the back end wasn't so blocky. When you stop paddling the back end turns with the wind. I need a small paddle for minor adjustments when stopped. Overall it's fast light enough to car top and very stable. Unfortunately I have not been able to use the kayak yet due to the weather. Overall the kayak is a drastic improvement to my Tarpon 120. It seems very well designed and well built. The only problem I've had is that the bottom of the center dry pod is extremely scraped from the factory. This did not occur from shipping. I was able to repair a couple minor holes that did not penetrate completely through the box. Even though it is still usable I was slightly disappointed. So glad I stepped up to purchasing the SS127. The combination of stability and storage incorporated into its design is phenomenal. 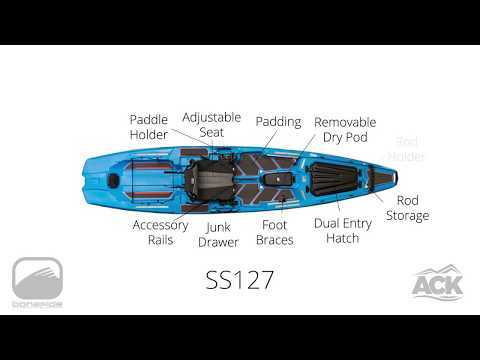 I have a spinal problems that have always kept me from standing to fish because of the constant balancing act, the SS127 allows me to fish sitting or standing and changing between the two all day without aggravating my back. Well done ' guys look forward to options becoming available to to customize it. Been out a couple times for a few hours. First off the kayak is light compared to my last ATAK 140. Easy loading on my bed- extender.It tracks about the same as a 14ft kayak. It glides better than my ATAK. It maneuvers better than my 14ft kayak, maybe because its 12.7in. Speed is ok. Stability, holy s#&t. Im 6' 240lb and I stood right up. I leaned over and it felt like it was pushing back. Great secondary. Dry pod, junk drawer, seat and general layout is first class workmanship. I got the sand color. It is not just solid color, it has very small black flexs in it. Looks sweet. My big complaint is that the seat is too narrow, at least for me. Inside dimension from frame is 16". After a couple hours it starts bothering my hip. My ATAK never was a problem. Bonafide needs to look into widening the seat. Love this boat! Paddles well, the seat is unbelievable and stability is crazy. I can stand with both feet on one side of the boat. The dry pod is a awesome feature if you plan on adding a fish finder. A: Yes, that is the full weight with the seat. Q: Best kayak trailer And mounting brackets (cradles) if transporting two ss127 kayaks? A: The Malone MicroSport Kayak Trailer Kit - 2 Kayak Package 461GS would be a great fit for your SS127s. It already has two SeaWing carriers installed and is a solid setup. A: Hello, the weight without the seat comes to 85 pounds, the weight with the seat is 94 pounds, and the weight of just the hull is 70 pounds. I hope this helps, and if not feel free to contact us at our email for more details! A: The BG2 and the SS127 are going to be fairly similar in the primary stability field. The Bonafide will be a little bit better since it is more flat when compared to the BG2's slightly curved primary hull. Q: What is the actual height of the seat in the low and high positions (boat floor to sitting part of seat. How does this compare with the WS ATAK 120. A: Hey there, thanks for your question! The height off the floor to the seat on the Bonafide SS127 is about 9 inches, while the ATAK 120 has a height of about 8 inches off the floor to the seat. They're fairly comparable, but the ATAK 120 would give you high, medium, and low options, while the SS127 has a high and low. Q: Manufacturer's YOUTUBE vid says a rudder mount is possible and the existing foot pegs are retained. Do you have a rudder available for this new yak, and will you install it before shipping. If so, the cost? Thanx. A: I ran out and tried a few different options, and it looks like the Feelfree Lure Rudder Kit will work with the Bonafide. Unfortunately, we can not install a rudder on the Bonafides before shipping them. Please let us know if you have any other questions! Q: Is there room behind the seat, immediately close to those standing pads, to install flush mount round holders? Thanks. A: I ran out there and held up the Harmony and Yak-Gear flush mount rod holders, and it does look like it will fit in that area. Please let us know if you have any other questions! Q: Could you tell me about the affirm payments ? Is it a finance plan where after being approved and making the down payment I would receive the merchandise? A: You are correct, it is a finance plan. So you will place your order and sign up with Affirm. Once they approve you, we will ship out the kayak. Then once you receive the kayak, you will start making payments and accruing interest. Please let us know if you have any other questions! Q: Is this kayak in sand color an in stock item? A: Yes, it appears that we currently have 7 of the True Grit Sand kayaks in stock. Please let us know if you have any other questions! Q: How long is the transducer hole under the dry pod? A: We measured the recess under the dry pod and it was 4.5". Please email us if you have any further questions!